The title of Radiologic Master of Sport is earned by achieving the highest overall score on the June CORE exam. 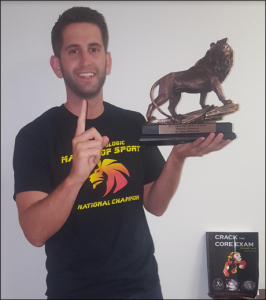 Prometheus Lionhart honors the Champion with a T-Shirt, custom Lion Trophy, and $3,000 cash. The legend began on the mean streets of Kings Park, NY. Accumulating trivial knowledge was in his blood; his mother is a high school English teacher. This academic pedigree was coupled with a father who was smart enough to avoid the poop and pus of medicine via an administrative career at NYU Langone as an Executive Director of IPA Clinically Integrated Network. The oldest of 4, Gary lead the charge towards a successful career starting with a B.A. degree in Biological Sciences at Binghamton University. Undergrad was followed by a return to Long Island for medical school at New York College of Osteopathic Medicine. Medical school was the site of many great victories for Gary. The greatest of these was the successful courtship of his beautiful fiancée Kate Murphy – who is currently a family medicine attending in the Northwell Health System. Gary matched to Hofstra Northwell School of Medicine’s diagnostic radiology program (formerly North Shore-LIJ) where he put his drive and serious mind to work. His academic prowess coupled with leadership skill earned him the title of chief resident. As a third year resident Gary silenced the anti DO crowd by achieving the highest score in the nation on the June CORE Exam.